Whether you re a total novice or a programmer shifting to C#, the newest version of this programming language is full of cool features you ll want to use. With its Visual Studio compatibility, C# is the perfect language for building Windows Vista applications. And the 2008 version works with LINQ, a query language with syntax similar to SQL but which simplifies database code and can also write que… ries on XML files. 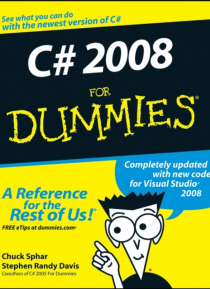 For the best basic C# how-to, it s hard to beat C# 2008 For Dummies. This plain-English guide to programming with C# can have you creating your first console application before you finish Part I. In fact, the basic template you create at that point will be the foundation of many other apps as you move through the book. Along the way you ll get the scoop on organizing your data, object-oriented programming (also known as OOP), and a great LINQ-related feature called delegates and events. You ll find out how to Create a console application template Perform logical comparisons Work with loops and if statements Understand collection syntax Use interfaces and object-oriented concepts Apply delegates and events, and much more You ll even gain some rare insight into how to understand error messages you may get when programming in C#. All the code you need can be found on the companion Web site, along with great bonus information that helps you do more with C# 2008. So what are you waiting for? Grab C# 2008 For Dummies and let s get started!